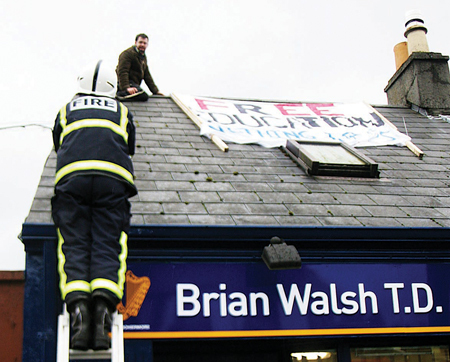 The scene at Brian Walsh's office yesterday when a protestor climbed onto the roof. There were dramatic scenes at the constituency office of a Galway West TD yesterday afternoon after a number of Free Education for Everyone (FEE ) members occupied the building to protest against student fee hikes, however tensions escalated during an hour-long stand-off involving gardai and the fire brigade, resulting in nine arrests. The anger and frustration felt by the students was certainly palpable with at least one FEE member taking the protest to the rooftop of the constituency office. Following a stand-off, believed to have lasted almost one hour, gardai removed the protesters one by one from the office. A Garda spokesperson confirmed that nine were arrested for offences under the public order act and taken to Mill Street Garda Station where they were being detained before being released, and a file is being prepared for the DPP. Speaking from the Dáil, Deputy Walsh said that while he had no difficulty with peaceful protests he did have difficulty with two protesters taking to the roof because of the health and safety dangers it posed, and the verbal abuse of staff and constituents. Deputy Walsh added that had he been notified he would have gladly met the protesters to discuss their concerns. “I have no problem with meeting with them. As a former SU president I appreciate where they are coming from, but I have a problem with the abuse shown to staff and with protesters being up on the roof. We’re very much aware of their concerns, I have met with student union leaders at length in the past few weeks and I have communicated those concerns to the Department of Education. There were 20,000 protesting in Dublin recently so the message is being listened to loud and clear. Further protests at this stage are premature. There has been a lot of speculation in the media about fees, but no decision has yet been made,” said Deputy Walsh. These latest protests come in the wake of the arrest of GMIT Student Union president, Joe O’Connor, and three fellow protestors who occupied an office in the Department of Social Protection in an effort to get the Government to honour pre-election promises in regards to student fees. Mr O’Connor, the USI president, and SU presidents from UCC and IT Carlow, occupied the room for around two hours on Tuesday before gardai forced their way in and arrested them at around 6.40pm. They were taken to Store Sreet Garda Station, released at 9.30pm, and a file is now being prepared for the DPP. Speaking to the Advertiser, Mr O’Connor described how the union and its members had taken this step because they felt “backed into a corner” and that direct action was needed to hold the Labour Party and the Government to account for the “broken promises that were made”. Page generated in 0.1923 seconds.